Back last Fall, when Churchill Downs was wrapping up its’ 2017 race calendar, my lovely daughter, Alex McLean Sharp, suggested that we do some “Give Aways” as promotions for both “The Pressbox” and the meet. We purchased some nice things at the Churchill Downs’ online Gift Shop and we promoted those. But, then, Alex suggested that we “give-away” a “Day at the Races” with her favorite father — that would be me, since she has only one. I laughed. Told a few jokes. But it truly didn’t ease my pain. (To quote one of the best Motown songs of all time.) I told her that no one on earth would enter that contest. Who on God’s green earth would want to “win” a full day with me, I asked her. She still convinced me, and sure enough, we had some people to enter. And, the winner(?) was Kim Spalding Brown, and her genuine as can be, husband Steve. So, we marked a day in 2018 — after the Kentucky Derby — to deliver the “prize.” A day in the beautifully remodeled, redesigned, and wonderful Turf Club at Churchill Downs. On Sunday, I finally got to meet Kim Spalding Brown and her wonderful, nice husband Steve. They joined me in the Turf Club. And, we had the time of our lives. Nothing better than to meet new people who genuinely love the sport of Thoroughbred racing. Nothing better than to share your interest, your passion, and your favorite memories and times. Nothing better than to spend time at one of the world’s most renown, historic, and beautiful racing venues and enjoy good company. We talked about horses. 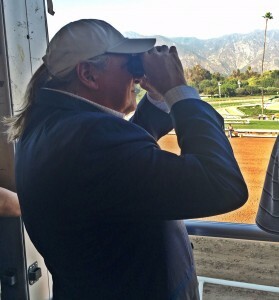 We talked about racing and handicapping (although Steve did much better than me on Sunday). We took a trip down to the paddock, and got to see one of Buff Bradley’s newest 2-year-olds get saddled for the first time. We placed a few bets; ate great food; celebrated life. Kim and Steve were delightful, honest, and wonderful people. Kim hails from Lebanon, KY. and knows Bill Mudd’s sister very well. Bill is one of the best people I have ever met, and helps oversee Churchill Downs, Inc. as the President and Chief Operating Officer. She also knew the great Sam B. Thomas, one of the most influential people in my entire life, both professionally and personally. Steve used to work for River City Distributing Company, a beer wholesaler who I just so happen to represent. He worked on a beer truck for years, before transitioning into another sales career. He is retiring in just 18 days now. Plans to play golf; help renovate and flip houses; and, maybe, someday, move part-time down South. We traded stories about our kids. Their son is a fantastic musician and plays in a band all over Louisville. We shared pictures we store on our phones. My favorites were the pictures of Steve and Kim’s “Grand Goats” that live in Bardstown. By the end of the day, we promised to meet up again soon. A round of golf, maybe. Another day at the races, perhaps. But at the end of the day, I now knew some new friends. And, despite the fact that I didn’t cash many tickets at the window, I was a winner. Again.